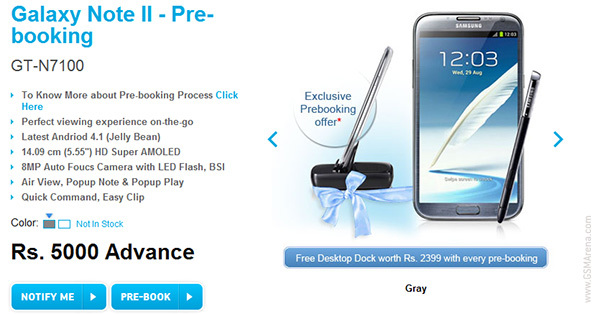 The Samsung Galaxy Note II has hit the pre-order stage in US and India. Those living in the US will now be able to pre-order the phone from US Cellular for $299.99 on a two-year contract for the 16GB model. Meanwhile, those of you who are reading this in India can now go on Samsung India's website and pre-order the unlocked version of the 16GB Galaxy Note II by paying ₹5,000 ($92) right now and the rest when the phone goes on sale. It's not mentioned, however, what the full price of the phone will be and considering the unlocked prices of these phones make sure you are willing to spend big bucks (around $800) before you go for the pre-order, as you cannot cancel it once you place the order. In case you do choose to pre-order, Samsung India will be happy to throw in a desktop dock worth $44 for free along with the phone.